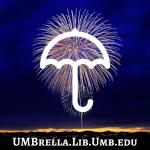 UMBrella Update: Changes to Your Library Login! As of TODAY, Library users will be prompted to enter their UMass Boston email username and password instead of their barcode when accessing the Library’s electronic resources from off-campus! Migrating the Library’s off-campus access to the University’s single sign-on (SSO) system streamlines patrons’ access to the Library’s resources whenever and wherever needed. Library barcodes are not going away! Patrons will still need their barcode to check out items from the Library, and, for the short term, to submit interlibrary loan (ILL) requests. Please continue to put UMBrella through its paces and share with us any issues you encounter or improvements you’d like to suggest. The feedback form awaits your comments! Thank you to UMass Boston’s Information Technology Services (ITS) and UMass’s University Information Technology Services (UITS) for their continued partnership in helping us enhance library services and resources for the campus community! UMBrella Update: OPEN for Research and Discovery! Good news: UMBrella is live! The Library’s new, powerful, state-of-the-art, single-stop information search and discovery tool can be accessed directly from the Library’s new and improved, mobile-friendly library homepage. We encourage you to jump right in to see how UMBrella enhances your research experience, and to let us know how it goes. Healey Library invites you to sign up for one of our introductory UMBrella training workshops offered throughout the month of February. Other training materials will be made available online for those who cannot attend a workshop in person. Please share your feedback about the new system so that we can continue to improve your search experience. Please fill out this comment form after you’ve had a chance to explore UMBrella. As with any major platform migration, we are committed to addressing any questions, problems, or inconsistencies that arise from the migration process. We sincerely welcome your suggestions and feedback. Please direct questions or comments to Library.Systems@umb.edu so that we can address them as quickly as possible! UMBrella users can search nearly all of the articles, books, videos, and e-books that the Library owns or subscribes to. In addition, users can search through multiple pathways. For example, users can access individual databases like CINAHL or JSTOR, or search specific journal titles through UMBrella. Healey Library staff will be using your feedback and questions to inform our ongoing interface adjustments and to troubleshoot any issues that arise. This process will result in a continually improving research experience for our users! We are pleased to announce that UMBrella uses the University’s Single Sign-On authentication system. Users log in to UMBrella the same way they access WISER and HR Direct, using their UMass Boston email username and password. We are in the process of extending the Single Sign-On system to replace the existing barcode and last name combination for off-campus access to databases and e-journal articles. The launch of UMBrella is a joint partnership between Healey Library, Information Technology Services, and UMass Information Technology Services. All of us wish you the best in your research journeys and look forward to your feedback on UMBrella! UMBrella: Covering All Your Research Needs is scheduled to launch at the end of this month! In preparation, could all faculty members please encourage their students, especially new, online, or transfer students, to contact the library to activate their library barcodes during the first week of classes? At the bottom of this message you will find both text and a graphic that you can include in your course syllabi, Blackboard course pages, wikis, or other course handouts and materials to get this important message across to your students. During this freeze, normal library operations will still continue, and library patrons with current, active barcodes will still be able to check out materials, submit interlibrary loan requests, and access library resources both in person and online. 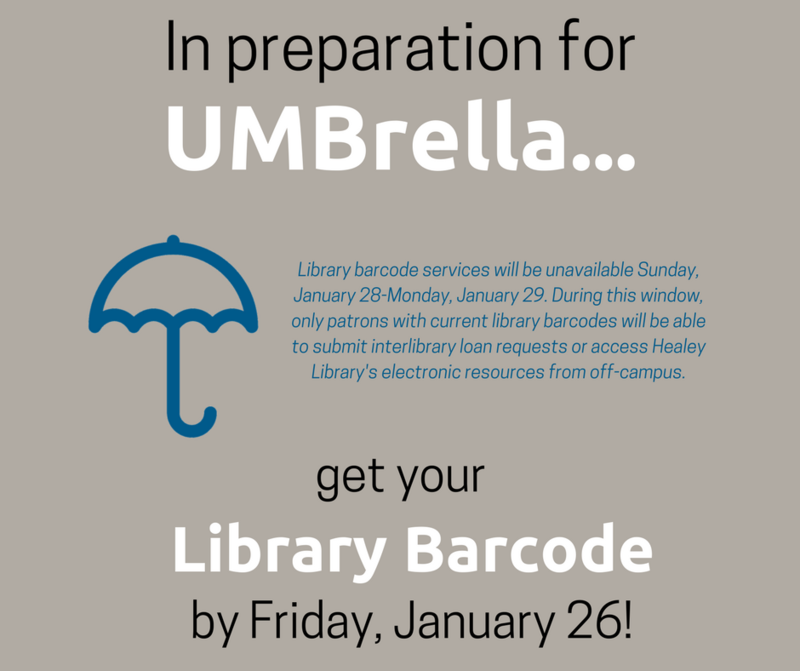 With your help in encouraging students to get their barcodes during the first week of classes, we can ensure that as few patrons as possible are affected by the two-day systems freeze leading up to the launch of UMBrella. As a reminder, you may also invite your students to sign up for one of our UMBrella workshops running in February. These workshops are open to the entire campus community and are intended to help our users make the most of this impressive new resource. Healey Library welcomes your questions, comments, or feedback directed to Library.Systems@umb.edu! We’re just a few weeks out from the launch of UMBrella: Covering All Your Research Needs! UMBrella: Covering All Your Research Needs is a powerful, state-of-the-art, single-stop research and discovery tool. It not only allows users to search the majority of the library’s resources from a single interface, but it also provides users with tools to manage and organize the resources they find. UMBrella is scheduled to go live on Wednesday, January 31, 2018! How do I learn more about UMBrella? Sign up to attend a workshop in February! Or, if you prefer, stay tuned for the self-paced instructional materials that will be published shortly after UMBrella launches. Do I need to sign in to use UMBrella? Users do not need to log in to search UMBrella. 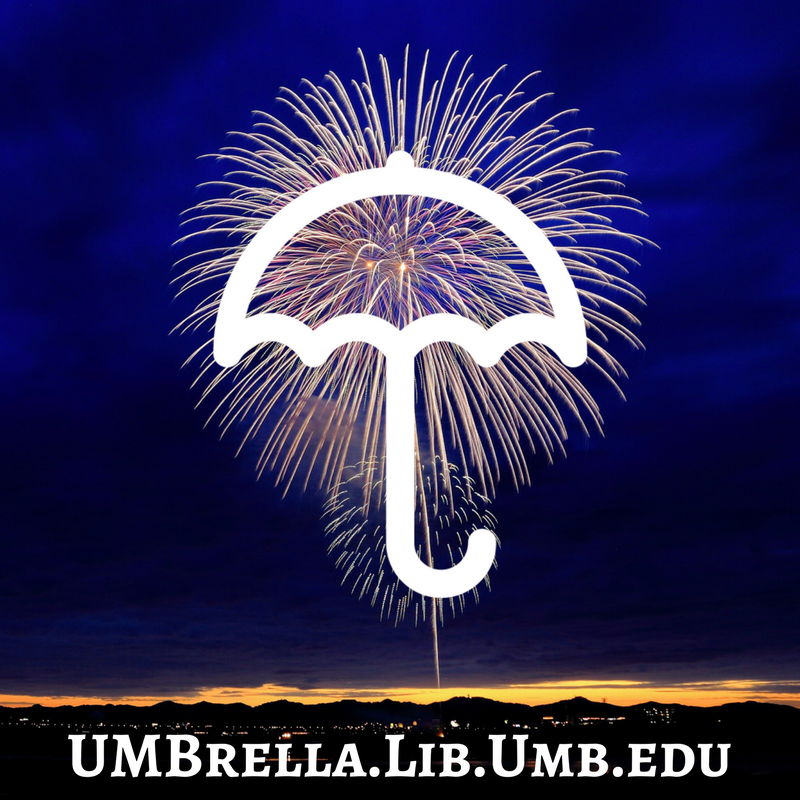 However, some UMBrella functions are only available to users after they log in, including viewing your patron account information, saving searches, and requesting books or articles from other libraries. How do I log in to UMBrella? We are pleased to announce that UMBrella will be using the University’s Single Sign On authentication system. Users will log in to UMBrella the same way as they access WISER and HRDirect, using their UMass Boston email username and password. How will UMBrella change what I do? 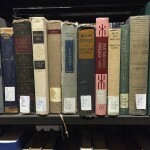 If you’ve ever been frustrated about having to search the library catalog plus multiple individual research databases in the process of locating resources for your research, we think you’ll be surprised and delighted by the ease with which you can search the majority of the library’s subscription resources, as well as high-quality, scholarly Open Access material, from this single search interface. Not only will searching be streamlined, but you will also have a single location from which you can save your searches, organize the resources you’ve found, and export them to a reference management tool like Mendeley or Zotero. You will also be able to use natural language searching and take advantage of UMBrella’s advanced algorithms and search filtering to quickly and efficiently navigate through the library’s resources. And better yet, UMBrella will be fully accessible on and responsive to any device you’re using, including smartphones and tablets. Will I still be able to access the library interfaces with which I’m familiar? Some of the library’s search systems and interfaces will stay exactly the same, including the A-Z list of Databases & Indexes. If you prefer to go directly to a particular database or journal, you will still be able to do that–in fact, UMBrella can help you get there even more quickly. There will also be a few changes to library interfaces. We will be releasing a newly redesigned library homepage to coincide with the launch of UMBrella. The new homepage not only has a cleaner look and feel, but it will also be easier to navigate from any device. Some library systems, including the Library Catalog (for searching for books, e-books, archival materials, and media) and Full Text Finder (for searching for individual journal titles), will be retired and replaced by the new UMBrella system and interface. Will anything change after the launch? Our priority goal is ensuring that all essential library functions will be available on January 31 to allow for an almost-seamless user experience. Our work doesn’t stop on January 31, however. There will still be plenty of fine-tuning to do and improvements to be made after the launch, many of which will be the result of input and feedback we receive from our users after you’ve had a chance to try out the new system. UMBrella: Covering All Your Research Needs was the brainchild of UMass Boston graduate student Rachel Hoffman, who was the unanimous winner of the campus-wide naming contest for our new research and discovery tool, held in summer 2017. If you have a question that isn’t covered above, send an e-mail to Library.Systems@umb.edu! UMBrella Update: Sign Up for a Workshop! Happy New Year from Healey Library! As we celebrate the arrival of 2018, we also eagerly anticipate the launch of UMBrella: Covering All Your Research Needs at the end of this month! In order to help the UMass Boston community take full advantage of UMBrella and all of its features, Healey Library is offering a series of drop-in workshops during the month of February. All faculty, staff, and students are welcome to attend these workshops, learn about the wealth of new features available to users, practice using the new tool, get guided assistance from Healey Librarians, and ask any questions they may have. Sign up for an UMBrella workshop through the UMass Boston Training Portal. Feel free to include this information in your syllabus or course materials as well! Workshops will be held in the Center for Library Instruction (CLI) on the 4th floor of Healey Library, room 15. If none of these scheduled times works for you, faculty may also request a one-on-one consultation with a librarian that we can schedule at your convenience. Please contact library.reference@umb.edu or sign up online to arrange an appointment. Additional instructional materials, including LibGuides and tutorials, will be provided shortly after the Go Live date. As always, Healey Library welcomes your questions, comments, and concerns about UMBrella, directed to Library.Systems@umb.edu.